So, in my previous post I talked about a fabulous Red Velvet Cake, “Devil’s Food”, now let’s talk “Angel Food”. Angel food cake is a Northern American favorite although the history is again a little sketchy. A similar version of this cake was found in an early southern cook book, “1871- Mrs. Porter’s New Southern Cookery Book, and Companion for the Frugal and Economical by M.E. Porter”. Although in this publication it was called “Snow Drift Cake” and included a substantial amount of butter, the preparation is otherwise very similar. Angel Food Cake has gone by other names though, including “Silver Cake”, “Cornstarch Cake” (that sounds appetizing doesn’t it? ), “Pennsylvania Dutch Wedding Cake”, and even “Funeral Cake” (meant to be easy on the system of a mourner). Despite the naming variation the process is usually the same. One of the defining characteristics of Angel Food Cake is the light airiness that is has and it sticky, and sweet but not too sweet flavor. It’s all in the technique when it comes to a great Angel Food Cake, so here are “THE RULES”. 1.) Egg Whites must first be whipped into stiff peaks, and other ingredients slowly folded in after. Beating or aggressively adding ingredients can cause the air to come out of the egg whites and deflate your cake. 2.) No Shortening or Leavening, these add too much heaviness. 3.) Use a soft flour ( NO whole grain) and sift it thoroughly. A light cake flour works best. 4.) The addition of cream of Tartar will prevent over browning. 5.) DO NOT grease the pan! This is important, the cake needs to stick to the pan to rise properly. 6.) Use a tube pan or bundt pan, the cake requires the extra surface area for proper rising. It will essentially climb the sides of the pan. 7.) Turn upside down while cooling, this prevents the light airy cake from falling and becoming a dense sticky mess. 8.) And finally, cut only with a serrated blade to prevent smushing (yes that is the technical term). Angel food cake is an angel in a lot of ways, it was named so because of it’s light airy nature, the food of angels. However it has a lot of great nutritional qualities too; especially for a dessert. A single serving of Angel Food Cake contains only 72 calories, 0.22gm of fat, 16 gm of carbohydrates, and 1.6gm of protein. A true dieters dessert dream. It’s a culinary angel too. It’s mild flavor allows the avid home chef (of which I am one) to get creative with toppings, the cake is a sponge style cake and will absorb all the juices, sauces, gnashes, compotes, and glazes that you put on it; adopting those flavors. Making this a very versatile cake. You can also add fine spices to the batter for added oomph. Or even toast it! Try adding pumpkin pie spice to the batter and adding a caramel glaze, or add cocoa to the batter, and top with strawberries and chocolate gnash; YUM! So, I’m sure you can now see why Angel Food Cake is a true angel in so many ways. Preheat your oven to 350 degrees. In a large bowl sift together the cake flour and 3/4 c. granulated sugar set side. In a large mixing bowl beat eggs until foamy then add cream of tartar, salt, and lemon juice. Begin to whip ingredients into stiff peaks once batter begins to thicken start to add remaining sugar 1 Tbsp at a time until shiny stiff peaks form and all sugar has been incorporated. Once peaks form add extracts and beat a few more seconds. Next fold in the flour and sugar mixture 1/4 c. at a time with a spatula or wooden spoon don’t stir remember rule number 1. You don’t want to deflate your batter. 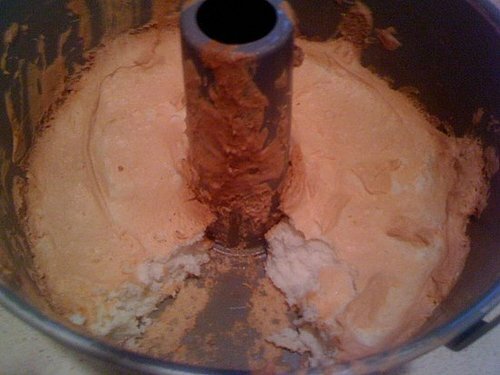 Pour batter into an ungreased tube pan. Tap the pan gently on the counter a couple time to break up large air bubble on the bottom of the pan. Smooth the top of the batter and bake for 40-45 minutes. Cake is done when skewer come out clean, and it springs up quickly when you touch the surface. Remove from the oven and immediately turn it upside down on a wire rack. Allow to cool for 1 1/2 hours, once it has cooled completely use a knife to loosen all of the edges including the center tube and turn cake out onto cake plate or serving plate. Cut with a serrated knife and serve with topping of your choice. 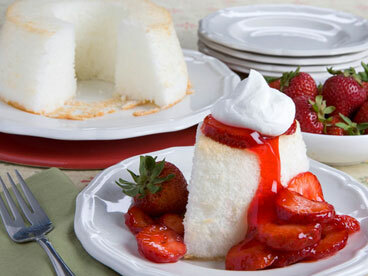 Angel Food Cake is best served the day it is made but will keep for 2-5 days in a sealed container. Enjoy!